Data transmission via the USB interface and further processing by the operating system (e.g. kernel USB-routines). If there is no loss of data (continuity check between the single receiver and host is positive) and the processing and the onward transfer from the host is reliable, this latency remains constant over time between different data streams. This delay can be calculated during the bootstrapping of the coherent receiver using the correlational analysis of the input channel signals. Cross-correlation functions must be calculated and their maximum can be used to determine the time variation in each of the channels, in order to calibrate the time alignment/channel data calibration programmatically on the host. In order to perform such calculations, the same noise signal must be sent to all single channel receivers. This noise signal must have a spectral density distributed throughout the operating band of the tuner, e.g. 24 … 1766 MHz in case of the R820-T/T2 . 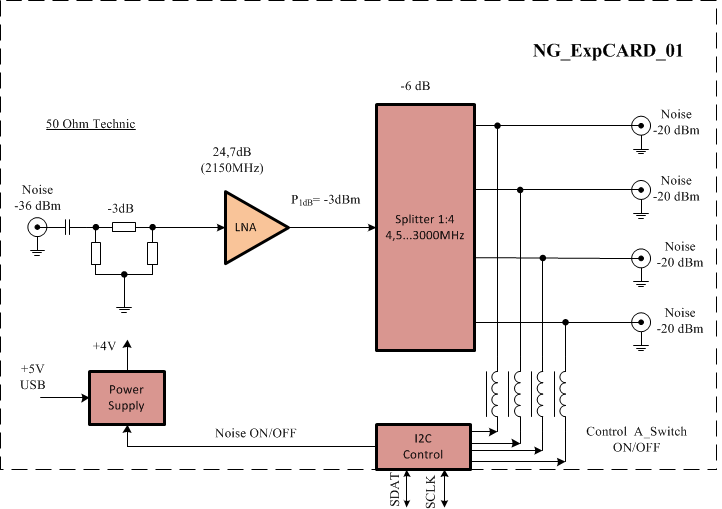 The Noise Generator Expansion Card (NG_ExpCARD) is designed to distribute the noise signal when the number of channels in the coherent receiver is greater than four. The input of the Noise Generator Expansion Card is connected to the outputs (1..4) of the Noise Generator Card. The 4 outputs of the Noise Generator Expansion Card can be connected to the 4 Antenna Switch Cards or to the input of the further 4 Noise Generator Expansion Cards. 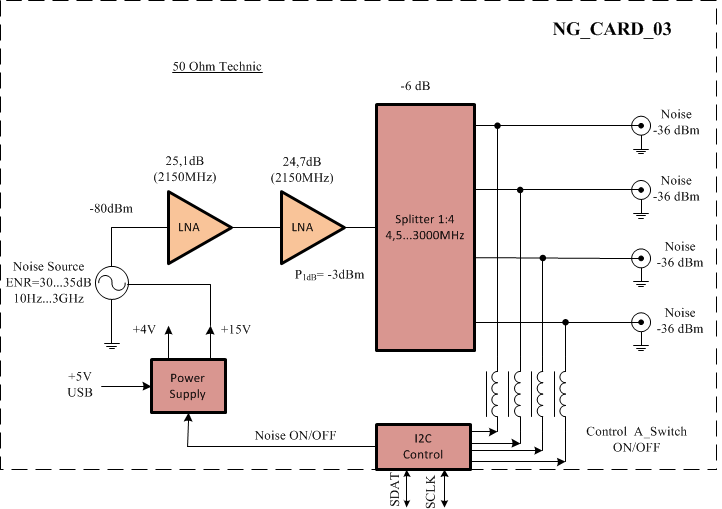 The figure below illustrates the collective usage of the Antenna Switch Card, Noise Generator Card and Noise Generator Expansion Card. These components can also be used not only in coherent receiver scenarios, but also in other areas, e.g. measuring filters or spectrum analyzers with a wide-band noise generator, where it is necessary to compare the noise source with a filtered (resulting) signal.